The Thinking (T) and Feeling (F) preference pair refers to how you make decisions, either by objective logic or subjective feeling. Thinking and Feeling are opposite preferences. A person’s natural tendency toward one will be stronger than the other. 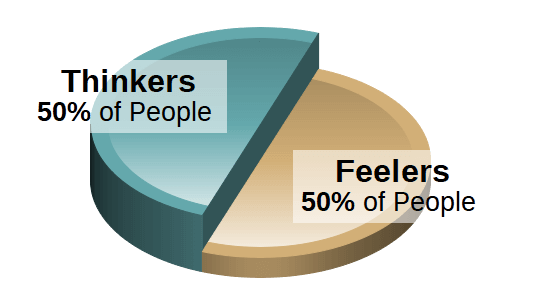 The general population is divided evenly between Thinkers and Feelers. The majority of females are Feelers while the majority of males are Thinkers. Thinking people are objective. They make decisions based on facts. They are ruled by their head instead of their heart. Thinking people judge situations and others based on logic. They value truth over tact and can easily identify flaws. They are critical thinkers and oriented toward problem solving. Thinking does not mean a person is without emotion. 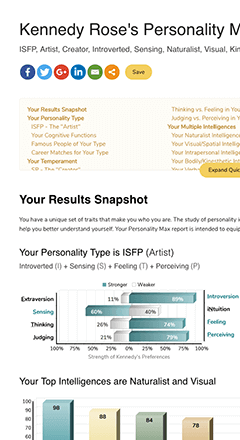 Learn your preferences, personality type, temperament and more. 2,434,900 tests have been taken so far.